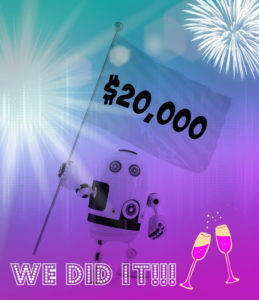 Mother of Invention hits $20k! Thank you so much to all of our splendid backers. We’re delighted to have met our funding goal so quickly. WE’RE GONNA MAKE THIS BOOK! We even have gotten a lovely write up in Books+Publishing today! But there’s no sitting on laurels at the Twelfth Planet Press ranch. We still have nearly a week left of our campaign, and a whole lot of fabulous stretch goals to reach for. We have even more potential stretch goals waiting in the wings to roll out if we get through these… so many cool and ambitious ideas to develop Mother of Invention into an even more epic project. Stand by. We’re shooting for the stars and beyond. We have already achieved our first goal! $21,000 – Dr Frankentastic! Tansy reads Mary Shelley’s Frankenstein as an episodic podcast, starting in September 2017. The twist – she’ll be swapping pronouns to make this a female-driven narrative but changing no other words! $23,000 – Essays Unbound! 3 artificial intelligence essays commissioned from exciting writers, exploring themes of gender & AI. We have Aliette De Bodard & K. Tempest Bradford signed up, with our 3rd essayist to be announced later. $24,000 – Enamel Planet! every backer at $25 or above receives a gorgeous Twelfth Planet Press logo enamel pin with their rewards. We all totally want the pin, right?? $25,000 – WHO KNOWS? Watch this space for further stretch goal updates. Have you backed yet? Want to update your pledge? Visit our campaign here.